Sickle cell disease (SCD) is the most common inherited disorder in the world. Nigeria has the highest number of individuals with SCD per country in the world. In Nigeria, 40 million people are healthy carriers of the sickle cell gene and 150,000 children are born every year with sickle cell anemia (SCA) (HbSS). SCD is associated with significant childhood mortality and is characterized by recurrent painful episodes, development of acute and chronic complications in the major organs of the body including the lungs, the heart, the kidneys, and the brain, as well as significant reduction of life expectancy. As a result of these acute and chronic complications, individuals with SCD are known to have frequent visits to hospital, thus increasing their cost of living and affecting their quality of life (QOL). The concept of QOL is defined by the WHO “as individual's perception of his/her position in life” in the context of the culture and value systems in which they live and in relation to their goals, expectations, standards and concerns." Health-related QOL (HRQOL), on the other hand, refers to the overall conditions of the QOL of ill or healthy individuals in relation to eight identified domains. QOL among SCD patient is thus a subjective assessment of how patients with SCD view their own well-being. It assesses the perception of SCD patients on the eight domains of HRQOL. The QOL of SCD patients is assessed using many QOL tools. However, the Short Form-36 (SF-36) is the most commonly used generic tool for measuring QOL. It was designed by the Medical Outcome Study (MOS) done by the RAND cooperation and has eight sections with 36 items altogether. Scores from all the components of the eight sections of the SF-36 are added together, and the average is obtained. Each score from different sections is then used to compare with similar scores from that of normal people to assess the QOL. The QOL among individuals with SCD has not been widely reported, especially in Nigeria. As a result of this paucity of research work on the subject matter in Nigeria, knowledge from our research work will assist in formulating the right policies that can impact on the management of SCD patients and treatment outcomes which in turn help improve their QOL. This study, therefore, is aimed at assessing the QOL using the SF-36 health survey among individuals with SCD attending Haematology Clinic at Ahmadu Bello University Teaching Hospital Zaria, Kaduna State, Nigeria. Ahmadu Bello University Teaching Hospital complex is located in Shika, Giwa local government area of Kaduna State, with a bed capacity of about 430 beds. The Sickle Cell Clinic in the Department of Haematology runs on Tuesday only, from 12:00 pm to 3:00 pm. The average patient load per clinic day is forty patients, and the categories of patients seen are those who are at least 10 years old. This is a hospital-based, cross-sectional, descriptive study that was conducted between November and December 2016, to determine the QOL among individuals with SCD attending Haematology Clinic in ABUTH Zaria. The study included only individuals with HbSS diagnosed through Hb electrophoresis, at least 3 years prior to the survey. The individuals were 10 years or older who regularly (at least three consecutive appointments) attend the Haematology Clinic. There was no control for this study and those excluded from the study were SCD patients that are acutely ill; HbSC phenotypes; and those with other chronic medical conditions such as hypertension, diabetes mellitus, or chronic kidney disease. The scope of QOL assessment of SCD patients covers only the general health perception, physical activities, social activities, emotional activities, vitality, pain, limitation of physical activities, and general health status of SCD patients. Sample size was determined using single-population proportion formula considering the following assumption: 95% confidence level (Zα/2 =1.96), 7.5% margin of error (d), and proportion (p) of poor HRQOL in terms of bodily functions from a previous study taken as 80% (0.80):n (sample size) = (Zα/2) 2 × P [1 − P]/d2, and hence calculated as n = 109. Factoring in a 10% nonresponse rate, and adding it to the sample size, therefore n = 120 was taken as the sample size for this study. Systematic sampling technique was employed in this study. A sampling interval (k) was first obtained by dividing the total number of patients that meet the eligibility criteria in the register (N) over the sample that are to be selected (n = 20) for each clinic day, i.e., k = N/n. Using an average clinic attendance of forty patients per clinic day, k = 40/20 = 2. Therefore, the first patient was picked randomly and the questionnaire was administered to the respondent; thereafter, the sampling interval (2) was added to the number of the subsequent respondents, i.e., questionnaires are administered to the 3rd, 5th, 7th, and nth patients until twenty respondents were obtained for the day. The selection process continues on each clinic day until the required sample size for the study was obtained. The instrument for data collection was a pretested, structured interviewer-administered SF-36 version 2 that was adopted from the MOS done by the RAND cooperation. The SF-36 is a generic HRQOL tool which measures a wide range of concepts. It is the most commonly used generic tool for measuring QOL in individuals with SCD and takes about 10–20 min to fill. It has eight sections with 36 items altogether, namely general health perception, social activities, emotional activities, pain, limitations of physical activities, physical health problems, emotional health problems, and energy and emotions. Subscale scores range from 0 to 100, with high scores representing better HRQOL (0 = worst score, 100 = best score). Two summary scores were also calculated; a physical component score and a mental component score, with scores standardized to a normal distribution (mean = 50 and standard deviation = 10). The SF-36 is described as an adequate tool to use from early adolescence; hence, it was used among all the study participants. However, a separate questionnaire attached to the SF-36 was used to collect data on respondents' sociodemographic characteristics. The adopted questionnaire was pretested on ten individuals with SCD attending SCD clinic at a general hospital, Malumfashi, Katsina State, about 70 km from the study location with similar characteristics as the study environment. Data collection took place between November 21 and December 31 among 120 respondents by the researcher and two trained research assistants who were trained prior to commencement of the study. All the administered questionnaires were returned completed, giving a response rate of 100%. The researcher supervised the overall data collection process and checked the filled questionnaires for consistency and completeness. Training was given to research assistants for 2 days. During and after the data collection, questionnaires were reviewed and checked for completeness and relevance by the researcher. Data collected were entered, validated, and analyzed using the Statistical Package for Scientific Studies (SPSS, IBM Corporation, New York, USA) version 23.0 and Microsoft Excel version 2007. For the descriptive aspect of the analysis, frequency distributions were generated for all categorical variables. Means, standard deviations and other descriptive measures were determined for quantitative variables. Student's t-test was used to compare differences between means, whereas Chi-square test was used for evaluating associations of categorical variables in contingency tables. Statistical significance was said to be achieved where P < 0.05. Approval to carry out the study was obtained from the Research Ethics Committee of ABUTH Zaria through the office of the head of Department of Haematology and Blood Transfusion. Permission was also obtained from the authorities in charge of the Haematology and Sickle Cell Clinics. Informed written consent was sought and obtained from all the eligible adult respondents after assuring them that all information obtained from them would be kept confidential. Parental consent and individual assent were obtained from those participants younger than 18 years of age. The study participants were informed about the purpose of the study and were informed of their right to voluntarily withdraw from the study anytime if they wish to do so. The questionnaires were thereafter administered to the eligible respondents. 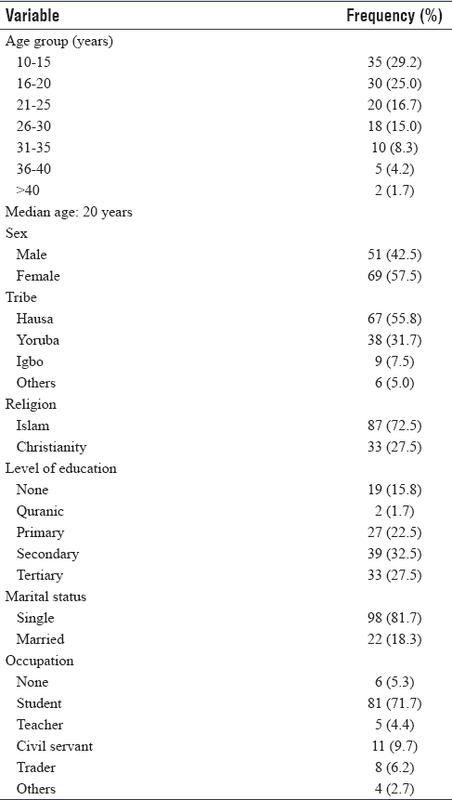 The sociodemographic characteristics of the respondents are shown in [Table 1]. The median age of the respondents was 20 years; majority (35 [29.2%]) of whom fell within the age group of 10–15 years (early adolescents), closely followed by those within the age group of 16–20 years (mid and late adolescents, 30 [25.0%]). Female respondents constitute the highest proportion (69 [57.5%]), with a third of all the respondents (39 [32.5%]) having attained secondary level of education. Majority of the respondents (87 [72.5%]) were Muslims, with more than half (67 [55.8%]) of them belonging to the Hausa tribe. In addition, the table also shows that majority of the respondents (98 [81.7%]) were not married (single), with 81 (71.7%) of them being students that are not gainfully employed. 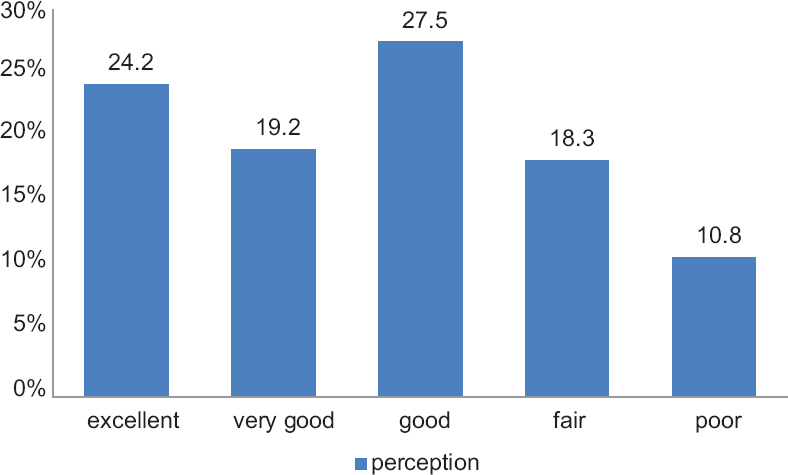 The bar chart [Figure 1] shows that, overall, there were more respondents with the perception that their general health status is good (33 [27.5%]) and excellent (29 [24.2%]), respectively, whereas only about 13 (10.8%) of them perceiving that their general health status is poor. [Figure 2] shows that there were more respondents (46 [38.3%]) with the perception that their current health status is much better now compared to a year ago, whereas only 7 (6.0%) mentioned that their health status is much worse now compared to a year ago. 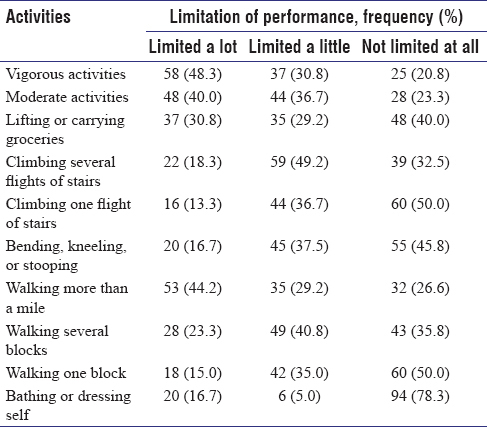 [Table 2] shows that the prominent areas where respondents' perception on their health status limits performance of activities a lot were in the areas of vigorous activities (58 [48.3%]) and walking more than a mile (52 [43.7%]), respectively. Almost half of the respondents (59 [49.2%]) had the perception that their health status limits the performance of climbing several flights of stairs only a little, whereas half of them (60 [50.0%]) had the perception that their health status does not limit the performance of climbing one flight of stairs. However, most of the respondents had the perception that their health status does not limit them from walking one block (60 [50.0%]) and bathing or dressing themselves (94 [78.3%]), respectively. Student's t-test conducted in [Table 3] showed that the QOL of males and females with SCA is significantly lower than that for individuals without SCA (P < 0.05). However, there was no statistically significant difference between the QOL of male and female respondents [Table 3]. [Table 4] shows a statistically significant relationship between respondents' QOL and educational status (P < 0.05). In the domain of general health, at least one in ten (10.8%) respondents perceived that their general health status is poor. This finding was higher when compared to that found in a study by Fuggle et al. where respondents rated their health days to be poor in 4.0% of the time. The difference in findings may be as a result of the different methodologies used by Fuggle et al., where a smaller sample (25 children) with a different age range (6–16 years) was used. Furthermore, the study instrument used by Fuggle et al. was children's health diary that measured only general health status and specific pain event instead of SF-36. The general health score was 47.0 ± 23.3 for males and 53.7 ± 20.2 for females. This is significantly lower than the general health scores for normal controls in a study by McClish et al. (77.1 ± 17.3 for males and 73.9 ± 19.0 for females). This finding is expected as individuals with SCA are prone to different morbid conditions and recurrent pain crises, hence having a general health score lower than that of normal controls. The impact of lower general health status among the respondents includes frequent hospital visits and hospitalization, increased school absenteeism for the students and subsequently poor school grades, loss of work hours for those that are employed, and increased health expenditure and budget to the state at large. In the domain of social functioning, a high proportion of the respondents believed that their health status does not affect their social activities as compared to 88.9% of respondents in a study by Forrester et al. in Kingston, Jamaica. The social functioning scores were 59.4 ± 27.3 for males and 59.6 ± 27.5 for females. This is significantly lower than the scores for normal controls in a study by McClish et al. in the US (86.6 ± 19.9 for males and 82.8 ± 22.1 for females), which is expected, thus indicating a lower QOL in this domain. Furthermore, respondents in our study had significantly lower social functioning scores than other patients with SCD in a similar study conducted by McClish et al. in the US (62.3 ± 27.6 for males and 62.4 ± 24.8 for females). The difference in the findings of this study may be due to the study design and age of the study population used by McClish et al. in which over 300 adult SCD patients in a community-based longitudinal cohort were followed up for 2 years. This implies that respondents in our study are prone to having fewer friends, poor peer relationships, and social isolation. In the domain of bodily pain, most of the respondents had bodily pains in the last 4 weeks (average of 20.8/week) in contrast to 90% of the respondents having bodily pains in the last 12 months (average of 7.5/week) in a study by Evensen et al. in the US. In addition, three-quarter of the respondents believes that their bodily pains interfere with their performance of normal activities in contrast to 67% in a study in the US by Evensen et al. The difference in findings may be due to the methodology used by Evensen et al., where adult sickle cell Quality of life measurement Quality of Care survey was employed. Furthermore, high level of bodily pain reported in our study is due to the fact that our study has been conducted during the winter period (November–December), which is the period individuals with SCD normally experienced pain crises. As such our result for bodily pain at this period will be higher when compared to the scores of other patients with SCD reported in other similar studies. Respondents in this study had bodily pain scores of 62.4 ± 24.3 for males and 62.3 ± 24.3 for females. This was significantly lower than the scores for normal controls in similar studies (79.6 ± 21.1 for males and 77.3 ± 22.1 for females) by McClish et al. in the US, which is expected, thus indicating a lower QOL in this domain of HRQOL. However, respondents in this study had better bodily pain scores than that of other patients with SCD in a similar study by McClish et al. in the US (50.8 ± 28.6 for males and 45.2 ± 26.0 for females). Equally, respondents from this study had better bodily pain scores than that of other patients with chronic diseases such as arthritis (bodily pain score of 58.6) in a study by Ballas et al. in the US. The difference in findings is because Ballas et al. used a multicentric study of hydroxyurea among 299 individuals with SCA. Equally, other study tools (Profile of Mood Status and Ladder of Life for Pain) were used in addition to the SF-36. The implications of lower bodily pain scores include increased school absenteeism among the respondents due to frequent emergency department visits and hospitalizations because majority of the patients are students and subsequently poor school performance. As majority of the respondents are also not gainfully employed, frequent use of health-care services makes them serve as liabilities to their guardians because of increased spending on health. In the domain of physical functioning and physical role limitation, a low proportion (25 [21.0%]) of respondents believed that their health status did not limit them from performing vigorous activities in contrast to 46.7% in a study by Crossby et al. in the US. Furthermore, about a quarter (28 [23.5%]) of the respondents believed that their health status does not limit them from doing moderate activities as compared to 30% in a study by Crossby et al. in the US. The observed difference between our study and that of Crossby et al. is because of smaller sample size (thirty individuals) used by Crossby et al. and also School Performance Questionnaire was used for the study instead of SF-36. A low proportion of the respondents believed that their physical health status is so severe that they could not take care of themselves in contrast to 37% in a study by Evensen et al. in the US. Respondents had physical functioning scores of 55.8 ± 25.1 for males and 57.4 ± 25.6 for females, whereas their physical role limitation scores for males and females were 26.5 ± 33.4 and 36.2 ± 38.4, respectively. Both scores were significantly lower than that of normal respondents in a study by McClish et al. in the US, which is expected due to the presence of a morbid condition in them. The implications of these results (i.e. having significant physical role limitation and reduced physical functioning) on the respondents include frequent utilization of health care services [acute care], low self-esteem and stigmatization. In the domain of emotional health and emotional health limitation due to physical health, about four in ten respondents believed that their physical health affects or limits their emotional role, which is in agreement with 40% of respondents with mood disorders in a study by Vilela et al. in Alagoas in Brazil. Both values were higher than the values for the general population according to the Diagnostic and Statistical Manual for Mental Disorders where the emotional health problems affect about 10%–25% of adult women and 5%–12% of adult men. In addition, over three-quarter (78.2%) of the respondents felt so down that nothing could cheer them up, which is higher compared to 27.6% of SCD patients with depressive symptoms in a study by Levenson et al. in the US. This finding is not expected as Levenson et al. showed that depression and anxiety predicted more daily pain and poorer physical and mental QOL in adults with SCD and accounted for more of the variance in all domains of QOL than hemoglobin type. Respondents had a total physical role limitation due to emotional well-being scores of 59.8 ± 14.2 for males and 58.7 ± 13.9 for females with emotional role score of 41.3 ± 38.9 and 42.5 ± 39.8 for males and females, respectively. Both these scores were significantly lower than that for normal people. The implication of these findings is that these respondents have a tendency of developing mental disorders such as anxiety disorder, depression, and mood disorders than the general population. In the domain of vitality, a high proportion of the respondents had lot of energy worn out and tired. The vitality score was 53.8 ± 13.3 for males and 52.2 ± 12.9 for females. This score was significantly lower than that for normal controls elsewhere in a study by McClish et al. in the US. The implication of lower vitality score includes interference with cognitive function, social withdrawal, modified daily activities, and decreased psychological well-being. In general, the study participants had significantly lower SF-36 scores in all the domains compared to normal controls, thus indicating a lower QOL among participants of this study. The QOL of both male and female participants was not significantly different. This is in agreement with a study done by McClish et al. in the US. This is probably due to the fact that both groups of patients received treatment from the same health-care provider and are mostly dependents (students) who cannot take any decision concerning their health. However, the QOL is related to the participants' educational status. This is in agreement with a study by Ahmed et al. in Saudi Arabia where they found out that SCD patients with a university degree had a better QOL than those without a university degree. The main reason for this relationship is that, the more educated a patient is, the better he or she is likely to know his/her disease condition, which subsequently helps the patient in avoiding anything that will trigger or aggravate the SCD crisis. This study was limited to only individuals with SCA attending Haematology Clinic at ABUTH, Zaria, and as such might not be a true reflection of the QOL of individuals with SCD in the study locality. Hence, results from this research cannot be generalized. Further study should be conducted at community level among individuals with SCD as this will give a more representative sample whose findings can be generalized. Another limitation for this study is the absence of a normal control group as it was a cross-sectional study of only individuals with SCD attending the Haematology Clinic. Hence, the comparison was made only with the data obtained by other researchers on similar studies. This study found that individuals with SCA carry a huge psychosocial burden impacting on bodily pain, physical functioning, physical role limitation, social activities, general mental health, emotional status, vitality, and perception of general health satisfaction. These aspects of life are equivalent to the core domains of the multidimensional SF-36, and consequently the study has shown that SCD undermines the QOL of patients attending Haematology Clinic at ABUTH, Zaria. Therefore, the QOL of patients with SCD attending Haematology Clinic at ABUTH, Zaria, is poor and significantly lower than those of normal individuals in all domains of HRQOL. Therefore, in addition to measures taken to reduce SCD complications, other interventions should target improving their physical, mental, and emotional health. We also recommend improving overall HRQOL among all the domains as a clinical end point. Akinyanju O. Issues in the management and control of sickle cell disorder. Arch Ibadan Med 2001;2:37-41. Olatunji PO. Influence of gender Senegal haplotype on the amelioration of the clinical severity in sickle cell anaemia. Niger Postgrad Med J 2000;7:5. World Health Organization. WHOQOL: Measuring Quality of Life 1999. Available from: http://www.who.int/healthinfo/survey/whoqol-qualityoflife/en. [Last retrieved on 2016 Nov 20]. de Haan RJ. Measuring quality of life after stroke using the SF-36. Stroke 2002;33:1176-7. History of Heamatology Department ABUTH. Available from: http://www.haematology.abu.edu.ng. [Last retrieved on 2016 Nov 27]. Bhagat VM, Baviskar SR, Mudey AB, Goyal RC. Poor health related quality of life among patients of sickle cell disease. Indian J Palliat Care 2014;20:107-11. Fuggle P, Shand PA, Gill LJ, Davies SC. Pain, quality of life, and coping in sickle cell disease. Arch Dis Child 1996;75:199-203. McClish DK, Penberthy LT, Bovbjerg VE, Roberts JD, Aisiku IP, Levenson JL, et al. Health related quality of life in sickle cell patients: The piSCES project. Health Qual Life Outcomes 2005;3:50. Forrester AB, Barton-Gooden A, Pitter C, Lindo JL. The lived experiences of adolescents with sickle cell disease in Kingston, Jamaica. Int J Qual Stud Health Well-being 2015;10:28104. Evensen CT, Treadwell MJ, Keller S, Levine R, Hassell KL, Werner EM, et al. Quality of care in sickle cell disease: Cross-sectional study and development of a measure for adults reporting on ambulatory and emergency department care. Medicine (Baltimore) 2016;95:e4528. Ballas SK, Barton FB, Waclawiw MA, Swerdlow P, Eckman JR, Pegelow CH, et al. Hydroxyurea and sickle cell anemia: Effect on quality of life. Health Qual Life Outcomes 2006;4:59. Vilela RQ, Cavalcante JC, Cavalcante BF, Araújo DL, Lôbo Mde M, Nunes FA, et al. Quality of life of individuals with sickle cell disease followed at referral centers in Alagoas, Brazil. Rev Bras Hematol Hemoter 2012;34:442-6. American Psychiatric Association. Diagnostic and Statistical Manual of Mental Disorders. DSM IV TR 4th. Washington, DC: American Psychiatric Association; 2002. Ahmed AE, Alaskar AS, Al-Suliman AM, Jazieh AR, McClish DK, Al Salamah M, et al. Health-related quality of life in patients with sickle cell disease in Saudi Arabia. Health Qual Life Outcomes 2015;13:183.